With so much at stake in healthcare, there has never been a more crucial time for the Nursing profession to shine. With the various reimbursement models in flux from Value-Based Purchasing to 30-day readmissions, the spotlight on acute care nursing is more intense than ever. Coupled with the abundance of data being captured in electronic health records (EHRs), these reform programs will eventually define the valuable work that Nursing provides, enhance nursing best practices, and continue to drive the tremendous impact that Nursing has on patient outcomes. 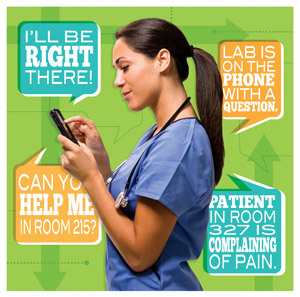 Nurses can also impact patient outcomes by leveraging technology beyond the EHR. Vocera® solutions continue to support the nurse, particularly at the bedside, by improving the quality of patient care and the patient experience. The ability to call a role, such as PACU Nurse or Bed Manager without knowing a person’s name, accelerates throughput and reduces wait time. When you can make one call to a group of people such as a Rapid Response Team or integrate the Vocera solution to a nurse call system, you can dramatically improve staff responsiveness and quality of care to increase HCAHPS scores. This ability to remain at the patient’s bedside while coordinating care is invaluable.